The National Hero of the Philippines, Dr. Jose Rizal, is one of the most interesting, brilliant, charismatic and intelligent figures of the Philippine's history. There seems to be always something new to discover about him. Rizal as sportsman and excellent student, as a world traveller, a romantic, an artist, a political activist, who spoke 22 languages and dialects, and of course, as a writer and martyr. But Dr. Rizal was also an ophthalmologist, not just an ophthalmologist but a pretty good one. Rizal the hero and Rizal the ophthalmologist are inseparably linked together. Why did he want to become an ophthalmologist ? Ophthalmology was not his real passion. But like for his political writings, for which he became famous, was it his destiny who led him. He wrote because of love, love for his country. He became an ophthalmologist also because of love, but love for his mother. His mother was turning blind and he desired to give her back her vision. Just like he wanted to heal his countrymen from the "blindness" by the oppressive foreign power, the Spanish friars. He did not immediately enroll in medicine when going to the Santo Tomas University in Manila. He enrolled first in the Faculty of Arts and Letters where he studied philosophy and letters. It was only upon learning that his mother was going blind due to cataracts that he decided to study medicine with the intention of specializing in ophthalmology at the university Faculty of Medicine and Surgery. From 1877 to 1882, he studied medicine, agriculture, surveying, and philosophy and letters at the University Santo Tomas where he received his Bachelor of Arts Degree. But, he did not complete his medical studies, he could no longer stand the discrimination by the Spanish Dominican friars against the Filipino students. In 1882, without his parents knowing, he secretly left the Philippines with the help of his older brother Paciano to complete his medical studies in Madrid, Spain. 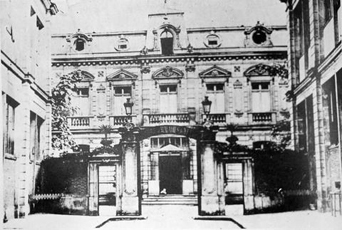 From 1882 Rizal studied at the Universidad Central de Madrid where he in 1884 earned his licentiate in Medicine . During that time, it was not necessary to follow further medical studies to call oneself a physician or to practice medicine. However, one could go on and obtain a doctoral degree after passing examinations and writing and orally presenting an approved thesis. In the 19th century, ophthalmology was already a separate specialty in Europe but there were no formal training programs at the universities yet. One became an ophthalmologist under the supervision of a well-known professor. If you were good you were allowed to personally assist your professor in his clinic while surgery. Training was very personalized. Rizal trained in Paris under the famous surgeon, Dr. Louis de Wecker (left) from November 1885 to February 1886. He worked as an assistant at de Wecker’s clinic (left) during those 4 months. 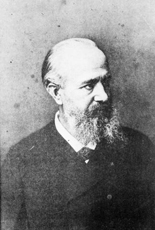 Dr. Louis de Wecker (1832–1906) was one of the foremost ophthalmologists of the 19th century. 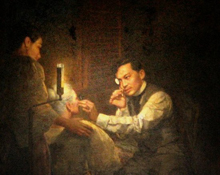 It was from him that Rizal learned various types of surgery, including the cataract-surgery technique he used to treat his mother. But he could not stay in Paris much longer. He felt that he had learned all the surgical procedures he could learn from Dr. de Wecker. So he informed Paciano that he would move to Germany. On February 3, 1886 he arrived in Heidelberg where he trained under Dr. Otto Becker (right). He wanted to learn other basic aspects of ophthalmology. Dr. Becker was a pioneer in ophthalmic pathology who wrote numerous works about the eye. He wrote a text on the anatomy of the normal and diseased lens and collected more than 1,800 pathologic specimens. Dr. Otto Becker (1828–1890) was an academic from whom Rizal learned the basics of ophthalmological examination and diagnosis. In Heidelberg Dr. Rizal attended the fifth centenary of the university on August 6, 1886. Three days later he left Heidelberg for Berlin. On August 15, 1886 Dr. Rizal arrived in Leipzig where he attended some lectures on the University of Leipzig. Mainly on History and Psychology. He got befriended with Professor Friedrich Ratzel, a famous historian and with Dr. Hans Meyer, an anthropologist.